The Second Annual Andrew Chamblin Memorial Lecture will be held at 7:30 pm on Thursday, April 15, 2010. 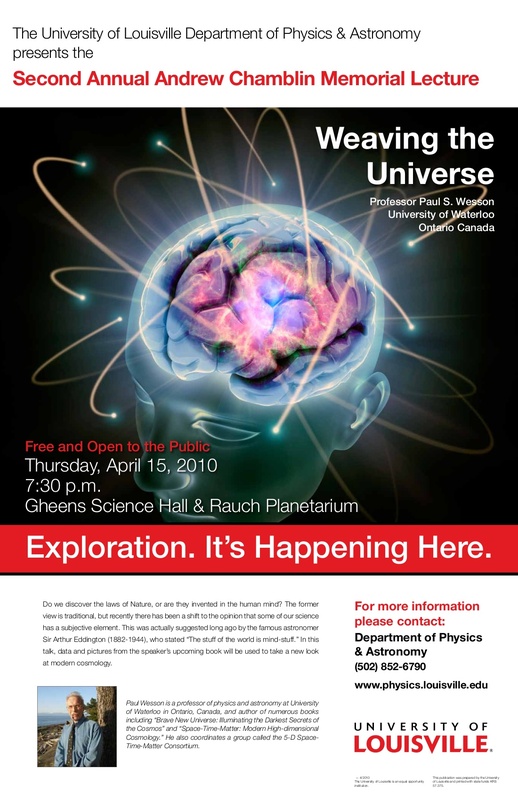 The talk will be presented in the Gheens Science Hall and Rauch Planetarium on the campus of the University of Louisville. Please join us as we again celebrate the life of Dr. H. Andrew Chamblin, who was Assistant Professor of Physics at the University of Louisville until his untimely passing in 2006. We welcome as distinguished speaker Dr. Paul Wesson, Professor of Physics and Astronomy at the University of Waterloo (Ontario, Canada), and author of numerous books including "Brave New Universe: Illuminating the Darkest Secrets of the Cosmos", "Space-Time-Matter: Modern High-dimensional Cosmology", and the forthcoming "Weaving the Universe". To find out more about Andrew Chamblin, visit www.andrewchamblin.org. If you would like to help make the Andrew Chamblin Memorial Lecture a sustainable annual event that benefits our community and honors the legacy of this gifted young man, please consider making a gift to the Department of Physics & Astronomy by visiting the University Giving Page and specifying a gift to "G1676:Andrew Chamblin Memorial Fund". Thank you.